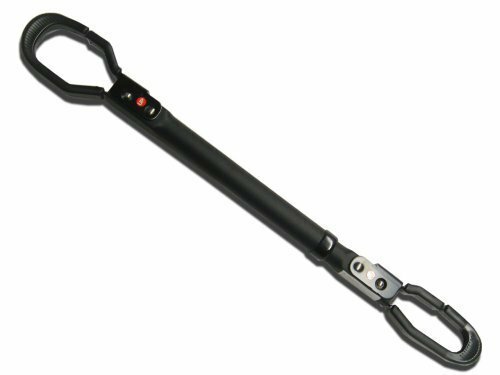 The Stoneman Sports QSP-610 Sparehand Adjustable Bike Bar Adapter fits almost any bicycle without a top bar, including women and children bikes. In a matter of seconds, use this adapter to add a top bar to your existing bicycle so you can store it with a standard bike rack or suspended hook. This adapter bar adjusts from 22-inches to 32-inche so it can attach to almost any sized bike. You can keep a clean, organized garage by storing bikes that won't normally store on traditional racks using this adapter. The QSP-610 features hangers which are coated in soft vinyl to prevent scuffs and other damage. The Stoneman Sports QSP-610 Sparehand Adjustable Bike Bar Adapter comes with a 1-year limited warranty that protects against defects in material and workmanship. Stoneman Sports is dedicated to innovation and simplicity and specializes in high-quality lifestyle and sports products. Their expansive product offering includes bike racks, kayak carriers, grilling accessories and much more. Stoneman Sports provides some of the most durable sports accessories at competitive prices and has great ideas for real-life applications.